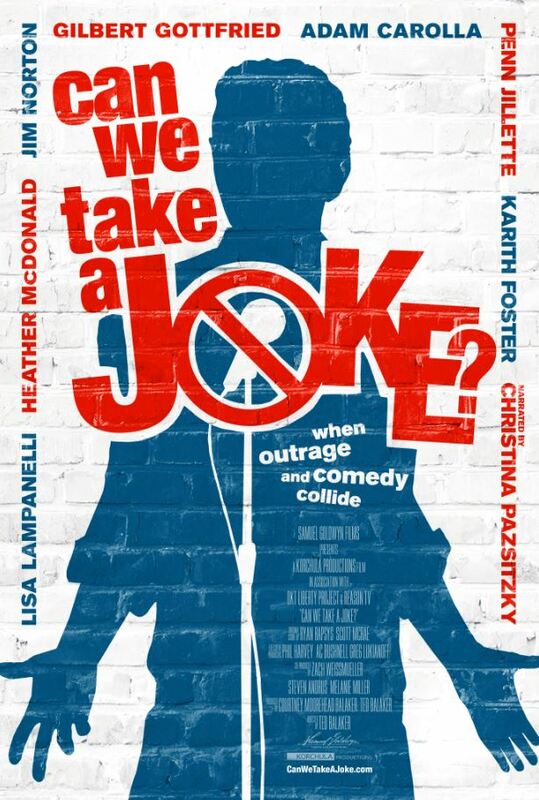 Review: Did Can We Take a Joke? Forewarn Middlebury College? Liberal intellectuals may be finally getting around to confronting the illiberal behavior of fellow liberals, particularly the recent episodes on American college campuses. Writing at The Atlantic, Peter Beinart examines the physical attacks at Middlebury College against Charles Murray and his faculty host and (liberal) interlocutor Allison Stanger. Hopefully, this introspection will prompt them and others to take a fresh look at Can We Take a Joke?, a documentary released in 2016 that highlighted the rising tide of anti-free speech sentiment among college students that now appears to be coalescing into a mass movement. The film, produced by Korchula Productions and directed by veteran documentarian Ted Balaker, uses comedy, particularly stand-up comedy, to show how campuses have become less and less tolerant of free speech. The film frames its discussion using clips of pioneer stand-up comic and social critic Lenny Bruce, whose sexually explicit jokes led to his arrest on obscenity charges and a landmark free speech case. Bruce’s comedy would be considered benign by current standards, however, and so the film spends most of its time on contemporary artists such as Gilbert Gottfried, Lisa Lampanelli, Penn Jillette, Karith Foster and Adam Carollla. Can We Take a Joke? uses the real-world experiences of these mostly liberal comedians to show the rise of intolerance against non–politically correct social commentary. Comedians are the proverbial canary in the coal mine, typically among the first wave of victims of intolerance or government oppression. This is because they are often on the front lines of social commentary and social change, as Brookings Institution scholar Jonathan Rauch points out in the film. Indeed, Lenny Bruce may be one of the best examples of the place comedy holds on the cusp of social change. He was dishonorably discharged (later reversed) from the U.S. Navy during active service in World War II, after his commanders took offense at his comedy routine featuring a performance in drag. Today stand-up comics use offensive material to draw attention to a wide range of social issues, from LGBT prejudice to body image to drug abuse to boorish behavior among the rich. Indeed, as several comedians in Can We Take a Joke? emphasize, their intent is often to either spark or contribute to a public discussion on these and other social and political issues. The documentary “Can We Take a Joke?,” a one-sided look at a multisided issue, does a fine job of defending a comic’s right to perform incendiary material. It would be better if it also at least acknowledged the possibility that some jokes ought not be told. In other words, free speech is a matter of taste, no longer a fundamental principle of public discourse. Notably the Times review (and others) failed to mention that almost all stand-up comedy is performed in closed venues requiring tickets or admission, whether in private clubs or on public university campuses. How does the attack on Charles Murray factor into this? Unlike Milo Yiannapolis, who is a professional provocateur, Murray is a serious researcher and scholar, with a sincere interest in provoking a civil public discussion on critical social issues of our times (see his CV here). He earned his Ph.D. in political science from the Massachusetts Institute of Technology, spent six years in Thailand engaged in development assistance and program evaluation, and served seven years at the American Institutes of Research, eventually becoming its chief political scientist. Murray’s pathbreaking book Losing Ground: American Social Policy from 1950 to 1980 became one of the principle critiques leading to bipartisan welfare reform in 1996. In person, he is remarkably humble, soft spoken, and respectful to his critics. Some of his later works were more controversial, particularly The Bell Curve, co-authored with Harvard psychologist Richard J. Herrstein, a serious attempt to present a wide range of scholarly research and data that showed intelligence was connected to American class structure in society, politics, and the workplace. It’s The Bell Curve that critics have rallied behind to oppose his public speeches, including the talk at Middlebury College (which was on a different subject). The outrage directed against Murray’s heresies is so great, however, that other respected academics can claim publicly and without accountability that this particular scholar, who has shaped national policy, has been thoroughly discredited (he hasn’t), can’t do math (he can), and lacks any conceivable merits worthy of offering him a speaking invitation. Can We Take a Joke? is a far-reaching documentary that is more relevant now than when it was released in 2016. For those who champion free speech, individual rights, and civil liberties, it should be a centerpiece for brokering public discussions on college campuses. The core sentiment underneath the attack on comedy is a harbinger of intolerance toward ideas more generally. If the film can open more eyes to the dangers of this anti-intellectualism masking as social justice, it is certainly worth the price of admission. Of that I have no doubt.